Those of us on the Sollelim hike kept cool today in the lush, shady greenery of the section of the Shvil Yisrael (Israel Trail) that runs along the edge of Nahal Snir. We waded through knee-deep (very cold) water to stand next to a beautiful waterfall, where we took in the sound of the rushing water. Carefully making our way through ankle-high clear running water over the basalt rocks formed by volcanic eruptions, we all felt exhilarated at the conclusion of the hike. A brief bus ride brought us to the ancient Talmudic village of Katzrin, where we met up with the Shoafim riders and saw the remains of a synagogue and numerous houses that have been restored after excavation. 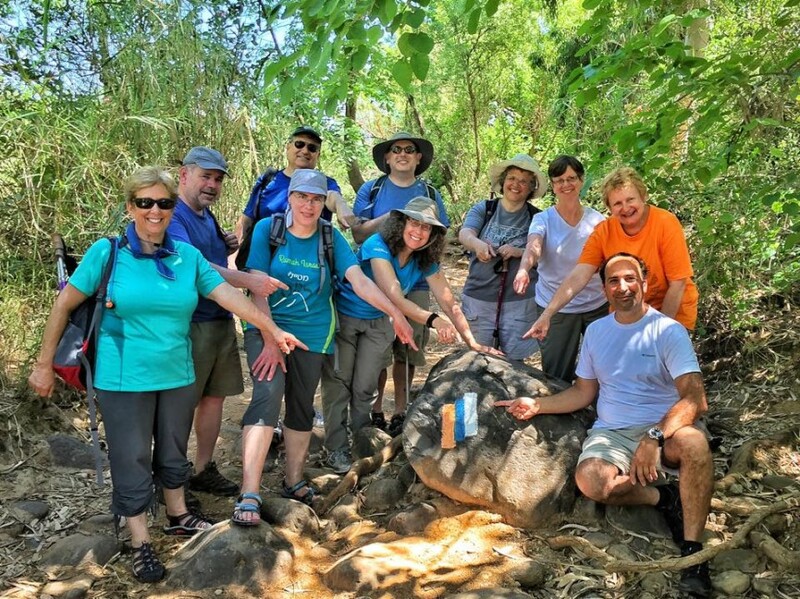 As we waited to meet up with those who had taken a longer hike, some of us took a brief walk to another ancient village, Yehudiah, where we enjoyed magnificent views of the Golan Heights and a glimpse of the Kinneret. After driving to Kibbutz Merom Golan, where we enjoyed a delicious lunch, some of us visited a family-owned winery. There we learned about the history of the wine-making industry in Israel, and particularly in the Golan Heights, where the combination of unique soil, climate, and people come together to make world-class wines. It is fitting that one of the wines carries the label “Volcanic,” in a tribute to the forces of nature that formed this area of Israel.